I know from experience that if you think positively, you will act positively. If you think negatively, you will act negatively. their brain in order to deal more effectively with a person living with dementia. How you act and how you think effects the perception of those around you. 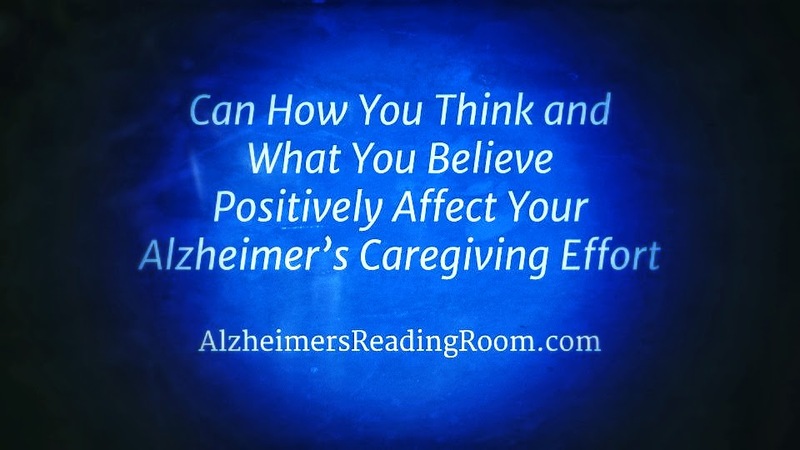 In the Alzheimer's caregiver paradigm it only stands to reason that if you think positively, and act positively, the person around you the most will also act positively. Of course, the inverse is also true. Here are some considerations for "feeding' your brain the right stuff. How often do you remind yourself of your own wonderful accomplishment? Often, never? Alzheimer's caregivers operate at a very high station in life. Think about it. We have in our care the life of another human being that over time becomes completely reliant on us. They rely on us to help them live their live. Each and every day we accomplish more than we could ever have imagined. Don't we? Could you ever have imagined accomplishing so much with your life? Our accomplishment is wonderful and live fulfilling. Others look at us and often say: you are a good husband/wife, a good son/daughter. The say to us you are a saint. They sometimes tell us we are going to Heaven. I am an Alzheimer's caregiver. Do it right now, and do it every day. Before you know you will rewire your brain and then you can get on with the task at hand. When it is all said and done you will have accomplished more than you could ever imagine. You will have accomplished more with your life than you ever imagined possible. Persons living with dementia are capable of more than we can imagine. We are often constrained by our own brains. Ironic isn't it? Learn More - Should you correct someone living with dementia? It is our brain that is holding us back. And, at the same time holding back the person living with dementia. We often focus on the wrong things. The acts, words, and behaviors that come along with the natural progression of Alzheimer's. These are the givens. As a result, we sometimes forget that life goes on. I chose Hello. Then I helped my mother Dotty unleash all the beauty and wonder that was still inside her. Once you choose "more there" you will begin living your life to the fullest. Every where I go I meet persons who have been touched by Alzheimer's that are filled with a sense of Hopelessness. They drank the Koolaid. They bought into the stigma. They are stuck in a very negative place. There is only one way to overcome this - by opening your heart and opening your brain. She delivered the message in a way I could never have done. She showed the world that people living with dementia are sweet, kind, and often fascinating. in a world filled with Alzheimer's. Don't drink the Koolaid. Rewire your brain. Think positively. Get out of your cave, and get out in the world and start doing. No excuses. Please take the time to read or reread the articles listed below. These article were written to help you rewire your brain, and to help you overcome the sense of hopelessness that often accompanies Alzheimer's and a related dementia. If you think positive and act positive you will see the person who is deeply forgetful, start smiling and acting positive. After about 18 months, I finally concluded that I was going to need to stop trying to "reason" with my mother; and that, I needed to find a "new way'" to deal with her. 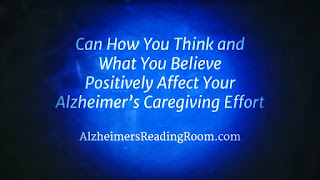 Everything you do with a person living with Alzheimer's has to start and end with positive reinforcement. Using positive language can make a huge difference in the lives of dementia caregivers and the people they care for. With someone living with dementia, we try to find the remaining strengths and spared abilities of that person. In Alzheimer's World the caregiver becomes kinder and gentler. And then, the remarkable happens, the Alzheimer's patient becomes kinder and gentler as they begin to mirror the behavior they receive. Bob DeMarco is the Founder of the Alzheimer's Reading Room (ARR). Bob is a recognized Influencer, speaker, and expert in the Alzheimer's and Dementia Community Worldwide. The Alzheimer's Reading Knowledge Base contains more than 5,000 articles. Bob lives in Delray Beach, FL. *** Sadness is a normal human emotion. Sadness is an emotional pain associated with, or characterized by, feelings of disadvantage, loss, despair, grief, helplessness, disappointment and sorrow.